Hudson Hawk is a 1991 American action comedy film directed by Michael Lehmann. Bruce Willis stars in the title role and also co-wrote both the story and the theme song. Danny Aiello, Andie MacDowell, James Coburn, David Caruso, Lorraine Toussaint, Frank Stallone, Sandra Bernhard, and Richard E. Grant are also featured. The live action film makes heavy use of cartoon-style slapstick, including sound effects, which enhances the movie's signature surreal humour. The plot combines material based on conspiracy theories, secret societies, and historic mysteries, as well as outlandish "clockpunk" technology à la Coburn's Our Man Flint movies of the 1960s. A recurring plot device in the film has Hudson and his partner Tommy "Five-Tone" (Aiello) singing songs concurrently but separately, to time and synchronize their exploits. Willis-Aiello duets of Bing Crosby's "Swinging on a Star" and Paul Anka's "Side by Side" feature on the film's soundtrack. Eddie "Hudson Hawk" Hawkins (Bruce Willis)—"Hudson Hawk" is a nickname for the bracing winds off the Hudson River—is a master burglar and safe-cracker, attempting to celebrate his first day of parole from prison with a cappuccino. Before he can get it, he is blackmailed by various entities, including his own parole officer, a minor Mafia family headed by the Mario Brothers, and the CIA into doing several dangerous art heists with his singing partner in crime, Tommy "Five-Tone" Messina (Danny Aiello). The holders of the puppet strings turn out to be a "psychotic American corporation", Mayflower Industries, run by husband and wife Darwin (Richard E. Grant) and Minerva Mayflower (Sandra Bernhard) and their blade-slinging butler, Alfred (Donald Burton). The company, headquartered in the Esposizione Universale Roma, seeks to take over the world by reconstructing La Macchina dell'Oro, a machine purportedly invented by Leonardo da Vinci (Stefano Molinari) that converts lead into gold. A special assembly of crystals needed for the machine to function are hidden in a variety of Leonardo's artworks: the maquette of the Sforza, the Da Vinci Codex, and a scale model of DaVinci's helicopter design. Sister Anna Baragli (Andie MacDowell) is an operative for a secretive Vatican counter-espionage agency, which has arranged with the CIA to assist in the Roman portion of Hawk's mission, though apparently intending all along to foil the robbery at St. Peter's Basilica. Throughout the adventure, Hudson is foiled in attempts to drink a cappuccino. After blowing up an auctioneer to cover up the theft of the Sforza, the Mario Bros. take Hawk away in an ambulance. Hawk sticks syringes into Antony Mario's face and falls out of the ambulance on a gurney, and the Marios try to run him down with the ambulance as his gurney speeds along the highway. The brothers are killed when their driver, startled by the array of syringes in Antony's face, crashes the ambulance. Immediately afterwards, Hawk meets CIA head George Kaplan (James Coburn) and his CIA agents–Snickers (Don Harvey), Kit Kat (David Caruso), Almond Joy (Lorraine Toussaint), and Butterfinger (Andrew Bryniarski)–who take him to Darwin and Minerva Mayflower. Hawk successfully steals the Da Vinci Codex from another museum, but later refuses to steal the helicopter design. Tommy Five-Tone fakes his death so they can escape. They are discovered and attacked by the CIA Agents, and Kaplan reveals that he and his agents stole the piece, and unlike Tommy and Hudson, had no problem killing the guards. Hawk and Tommy cause Snickers and Almond Joy to be killed by their own explosive device, and they escape. Kit Kat and Butterfinger take Anna to the castle where the Macchina dell'Oro is being reconstructed. A showdown takes place at the castle between the remaining CIA agents, the Mayflowers, and the team of Hudson, Five-Tone, and Baragli. Kit Kat and Butterfinger are betrayed and killed by Minerva. Tommy fights Darwin and Alfred inside Darwin's speeding limo, and Hudson fights George Kaplan on the roof of the castle. Kaplan topples from the castle and lands of the roof of the limo. Alfred plants a bomb in the limo and escapes with Darwin; Tommy is trapped inside and Kaplan is hanging onto the hood. The bomb detonates as the limo speeds over a cliff. Darwin and Minerva force Hawk to put together the crystal powering the machine, but Hawk intentionally leaves out one small piece. When the Mayflowers activate the machine, it malfunctions and explodes, killing Minerva and Darwin. Hawk battles Alfred, using Alfred's own blades to decapitate him. Hawk and Baragli escape the castle and discover Tommy waiting for them at a cafe, having miraculously escaped death. Hawk finally gets to enjoy a cappuccino. The soundtrack album was released by Varèse Sarabande in 1991, there are eleven tracks in all. The film's score (represented by tracks 4-9) was composed and conducted by Michael Kamen with Robert Kraft; Kraft also wrote "Hawk Swing" and co-wrote the film's theme with star Bruce Willis. The song "The Power" by Snap! is featured, although not included on the soundtrack, when Hudson Hawk is taken for the first time to the headquarters of the Mayflowers. Minerva Mayflower, played by Sandra Bernhard, is sitting on a desk singing the song while it plays on her headphones. Hudson Hawk was resoundingly panned by critics. On Rotten Tomatoes, the film has a rating of 26%, based on 34 reviews. On Metacritic, the film has a score of 17 out of 100, based on 15 critics, indicating "overwhelming dislike". In the Chicago Tribune, Terry Clifford observed that "the end result is being thrown up on selected screens this weekend, and the suspicion that this was a pooch turns out to be undeniably correct. Boring and banal, overwrought and undercooked, Hudson Hawk is beyond bad." The saddest thing about Hudson Hawk is that director Lehmann and co-screenwriter Waters were previously responsible for the clever, audacious "Heathers," a film that represented all that is most promising about American film, while this one represents all that is most moribund and retrograde. Perhaps they both earned enough money here so that they won't be tempted to indulge themselves in similar big-budget fiascoes. Here's hoping. Hudson Hawk is a terrible movie, and deserves the cold shoulder it has received at the box office. But being bad doesn't always explain the failure of big, star-driven pictures. In the vernacular of Hollywood marketing, these movies tend to be "review-proof," meaning that critics can carpet-bomb them with all the armor-piercing adjectives they can muster and the beasts will not fall. Think of the Rambo and Rocky sequels, all those Chuck Norris and Steven Seagal movies . . . the reviews ricocheted off their thick hides. Variety called the film "a relentlessly annoying clay duck that crash-lands in a sea of wretched excess and silliness. Those willing to check their brains at the door may find sparse amusement." Peter Travers of Rolling Stone said of the film, "A movie this unspeakably awful can make an audience a little crazy. You want to throw things, yell at the actors, beg them to stop." James Brundage of AMC filmcritic said the film was "so implausible and so over the top that it lets inconsistency roll off like water on a duck's back." Janet Maslin in the New York Times called the film "a colossally sour and ill-conceived misfire" and denounced the film for "smirky, mean-spirited cynicism." Writing in The Washington Post, Joe Brown said, "To say this megamillion Bruce Willis vehicle doesn't fly is understatement in the extreme... Hudson Hawk offers a klutzy, charmless hero, and wallows dully in limp slapstick and lowest common denominator crudeness." Chris Hicks wrote in The Salt Lake City Desert News, "What is most amazing is the pervasive silliness that has the cast acting like fools without ever getting a laugh from the audience. It's hard to imagine a major, big-budget movie that could come along this year and be worse than Hudson Hawk, a solid contender for the longest 95 minutes in movie history. Owen Gleiberman in Entertainment Weekly called the film "a fiasco sealed with a smirk." It received three Razzie Awards for Worst Director (Michael Lehmann), Worst Screenplay and Worst Picture with additional nominations for Worst Actor (Bruce Willis), Worst Supporting Actor (Richard E. Grant) and Worst Supporting Actress (Sandra Bernhard). In his autobiography, With Nails, Richard E. Grant diarises the production of the film in detail, noting the ad hoc nature of the production and extensive rewriting and replotting during the actual filming. Willis went on to become one of the leading box-office stars of the 1990s, but has not made any further forays into scriptwriting. The film was also a Box office bomb, partly because the film was intended as an absurd comedy, yet was marketed as an action film one year after the success of Die Hard 2. 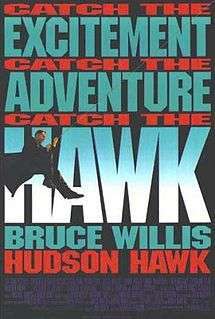 When the film came to home video the tag line "Catch The Adventure, Catch The Excitement, Catch The Hawk" was changed to "Catch The Adventure, Catch The Laughter, Catch The Hawk". The film was released twice on DVD, first in 1999 and again in 2007 with new extras. In 2013 Mill Creek Entertainment released the film for the first time on Blu-ray in a 2 Pack set with "Hollywood Homicide" all extras were dropped for the Blu-ray release. A video game based on the film was released in 1991 under the title "Hudson Hawk" for various home computers and game consoles. Sony Imagesoft released versions of the game for the NES and Game Boy, while Ocean Software released it for the Commodore 64, Amiga, ZX Spectrum, and Atari ST. It is a side-scrolling game where the player, as the Hawk, must steal the Sforza and the Codex from the auction house and the Vatican, respectively. Then Castle Da Vinci has to be infiltrated in order to steal the mirrored crystal needed to power the gold machine. On his journey, Hawk must face many oddball adversaries, including dachshunds that try to throw him off the roof of the auction house, janitors, photographers, killer nuns, and a tennis player (presumably Darwin Mayflower). ↑ Greenberg, James (1991-05-26). "FILM; Why the 'Hudson Hawk' Budget Soared So High". The New York Times. Retrieved 2010-10-29. ↑ "Hudson Hawk". Box Office Mojo. ↑ "Hudson Hawk". Washington Post. 1991-05-24. Retrieved 2010-10-28. ↑ "`Hawk` Better Fly". Chicago Tribune. 1991-06-02. Retrieved 2010-10-29. ↑ Plaskin, Glenn (1991-05-19). "Real `Hudson Hawk`". Chicago Tribune. Retrieved 2010-10-29. ↑ Easton, Nina J. (1991-05-19). "Summer Movie Special : Bruce & Joel's Q & A Adventure : Partners-in-action Bruce Willis and producer Joel Silver fire away on everything from 'Hudson Hawk' to the press". The Los Angeles Times. Retrieved 2010-10-28. ↑ "Hudson Hawk". Rotten Tomatoes. Retrieved August 30, 2016. ↑ "Hudson Hawk". Metacritic. Retrieved August 30, 2016. ↑ Terry, Clifford (1991-05-24). "Smug `Hudson Hawk` Looks Like A Turkey". Chicago Tribune. Retrieved 2010-10-29. ↑ Turan, Kenneth (1991-05-24). "Bruce Willis' 'Hudson Hawk' Fails to Fly as Comedy Caper". The Los Angeles Times. Retrieved 2010-10-28. ↑ Mathews, Jack (1991-06-09). "FILM COMMENT : Who Was That 'Moonlighting' Detective? Maybe He Can Piece It Together for Us". The Los Angeles Times. Retrieved 2010-10-28. ↑ "Hudson Hawk". Variety.com. December 31, 1990. ↑ Travers, Peter. "Hudson Hawk". Rolling Stone. Archived from the original on 2008-06-16. ↑ Brundage, James. "Hudson Hawk". Filmcritic. Archived from the original on 2007-11-06. ↑ Maslin, Janet (May 24, 1991). "Review/Film Bruce Willis as a Hip Cat Burglar". The New York Times. Retrieved August 30, 2016. ↑ Brown, Joe (May 24, 1991). "Hudson Hawk". Washington Post. Retrieved August 30, 2016. ↑ Hicks, Chris (May 27, 1991). "Film review: Hudson Hawk". Deseret News. Retrieved August 30, 2016. ↑ "Hudson Hawk". Entertainment Weekly. May 31, 1991. Retrieved August 30, 2016. ↑ Fox, David J. (1991-05-28). "No Blockbusters Among This Crop of Memorial Day Movies". The Los Angeles Times. Retrieved 2010-12-20. ↑ Fox, David J. (1991-05-29). "'Backdraft' Burns 'Hawk's' Wings at the Box Office". The Los Angeles Times. Retrieved 2010-10-03.